How to share internet over USB from PC to a Windows Phone 8 device? I know, that this works out of the box for Zune-compatible devices, but what about Windows Phone 8? I don't have a micro-SIM yet and there is no way to set up a WiFi hotspot. By judging what you are trying here to accomplish, I think you are mentioning Reverse USB Tethering. Windows Phone 7 had it by default via Zune. In Windows Phone 8 the dev team dropped this feature. So there is no way you can share your PC's internet to phone via USB. Most likely what you can do to avail internet in phone, you can set an adapter up as an access point or buy a Wifi router. Then connect your phone to the router via cable or Wifi. As far as I know there is no way to share the comptuers data connection with the phone over USB, you could do it with something Virtual Wifi Wrouter. I've used it and it works very well. First one " Ask me before using USB DATA connection "
Second one " Notify me when i connect to a slower charger "
There is currently no way to connect to internet over USB. You can only connect to the internet over 2G/3G/4G and Wi-Fi at the moment. I am using 8.1 on Lumia 920 and in search I wrote "usb settings" then went to "local" tab, there it was found. So it is there in 8.1 Cyan version. 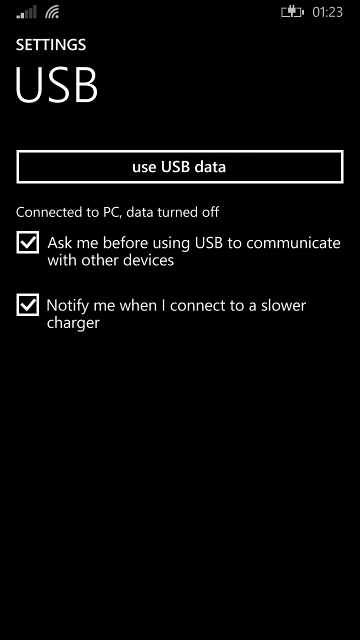 On my Lumia 830 running WP 8.1 GDR2, I have a USB menu inside the Settings that allows to share the data connection from a PC. Not the answer you're looking for? Browse other questions tagged 8.0 internet-sharing or ask your own question. how to connect to my pc internet with my nokia lumia 1020? Reverse Tethering of Lumia 535? When can we expect a Wi-Fi hot-spot feature for Nokia Lumia 800? How to tether a Windows Phone 8 phone to a Samsung tablet via Bluetooth?